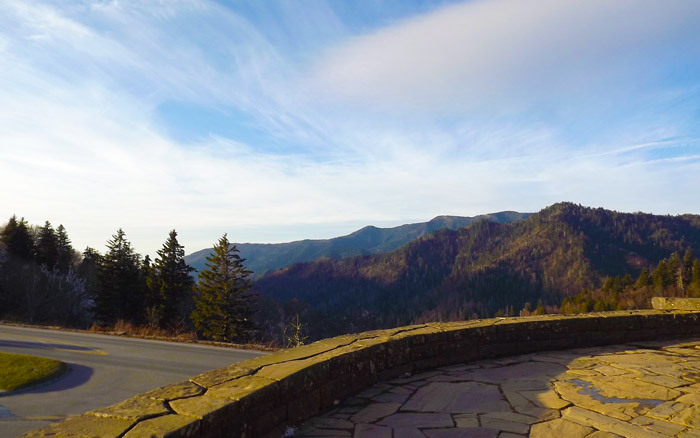 Apart from the chance to see gorgeous mountain views, the famous Appalachian Trail, or just drive to one of the highest elevation roads in the Great Smoky Mountains, Newfound Gap Road is a must see. First and foremost, Newfound Gap Road, US 441, is a scenic drive that does not permit commercial traffic. Even if this road through the Smokies can become a bit crowded, you won't have to worry about getting stuck behind a big rig. In fact, the drive from Gatlinburg to Newfound Gap is one of the most beautiful in the Smoky Mountains. There are great hiking trails to explore like Alum Cave and Chimney Tops on the way. Additionally, you can even access the Appalachian Trail from the Newfound Gap parking area that rests at an elevation of 5046 feet. Be sure to make a drive on New Found Gap Road as part of your cabin rental vacation in the Smoky Mountains! The Newfound Gap Road climbs nearly 3,000 feet from Gatlinburg to the Tennessee-North Carolina state line. Motorists will ascend the mountains passing through several distinct types of hardwood forests. Upon reaching the summit, visitors will be surrounded by unique spruce-fir forests that have more in common with forests in Canada than those in the rest of Tennessee. As its name suggests, Newfound Gap is a relatively newly discovered passage through the mountains. Long before the national park was established and discovery of Newfound Gap, Indian Gap was the main route for crossing through the Smokies. Indian Gap Road followed an old Indian path, but was a rough trail that made travel difficult. Time would show that Indian Gap was not the lowest gap for a road to cross the Smokies. Arnold Guyot, a surveyor and geographer, eventually discovered that Newfound Gap was a more accessible place to build a road through the mountains. By 1932, the highway US 411 was completed along the route proposed by Guyot and gave us Newfound Gap Road as it appears today. Though the Great Smoky Mountains National Park was created in 1934, its formal dedication was in 1940. President Roosevelt and many park supporters gathered to commission the park at the summit of Newfound Gap Road. 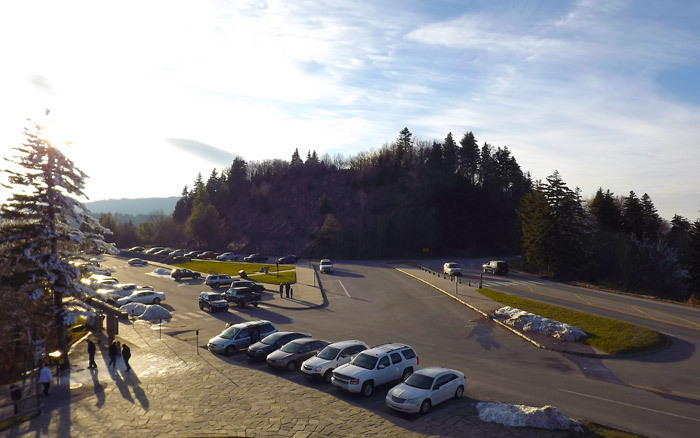 When you visit Newfound Gap, you'll notice a massive stone stage built into the mountainside. This is the Rockefeller Memorial, built by the CCC in the 1930s to honor a 5 million donation to the national park from the Rockefeller family. This generous gift was used to purchase much of the lands that would be protected by the Great Smoky Mountains. The memorial itself served as the grandstand for the national park's dedication ceremony. After all, there was a lot to celebrate, for the Smokies had been established "For the permanent enjoyment of the people." In fact, much of the Newfound Gap Road, as we know it, was a project of this New Deal Program. These dedicated workers cut and blasted the rock to improve the existing road and add overlooks, pull-offs, and picnic areas. According to the park service, the existence of Newfound Gap is a primary reason why the Smokies don't have an entrance fee. To understand why, you'd have to go back to the time before the formation of the national park. At the time, the state of Tennessee, which had jurisdiction of the road and only agreed to transfer ownership of it on the condition that the national government would never levy a toll on the road. Newfound Gap Road was one of the only dependable routes through the mountains, so Tennessee ensured that a fee would never hamper transportation. To this day, vacationers can enjoy the beauty of the Smoky Mountains without paying a dime. On average, Newfound Gap Road receives 69 inches (over 5 feet) of snowfall annually. To put that in perspective, Minneapolis has 46 inches of the white stuff. Thanks to the gap's high elevation, this area is generally cooler or wetter than nearby Gatlinburg. Though Newfound Gap Road is opened year-round, it occasionally must close due to massive amounts of snow. Adding to the duration of road closures is the fact that the park service cannot use salt or other chemicals to melt ice on the road. The use of salt would harm the fragile ecosystems in the mountains, so it really is for the best. Famously in the Blizzard of 93', Newfound Gap Road received 5 feet of snow in two days. Thankfully, this was a once in a lifetime storm. Once you reach the gap itself, you have several options. You can continue your scenic drive towards Cherokee and the North Carolina side of the Smokies. Vacationers can also explore the 7 mile Clingmans Dome Road that continues to the highest peak in the national park. This road is closed during the winter, but visitors can usually reach Clingmans Dome beginning in March or April until November 30th. Or you can simply explore Newfound Gap itself. Watch a beautiful sunset or enjoy a short hike on the Appalachian Trail. There's so much to experience in the Smoky Mountains, so be sure to use our area information guide to help you plan your trip. We also offer cabin rentals that make it easy to explore the best that the Great Smoky Mountains National Park, Gatlinburg, and Pigeon Forge have to offer!